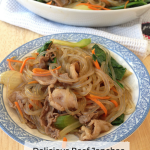 Who wants to enjoy a Korean donut made from rice and sweet potatoes that is free of the top 8 allergens? I do! 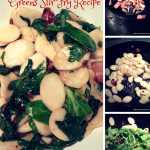 I am so excited to share with Nut Free Wok readers a recipe guest post by Candice Van Devender! Candice’s dad tells her stories about buying hot and tasty chapssal donuts from street vendor when he was a child in Korea. 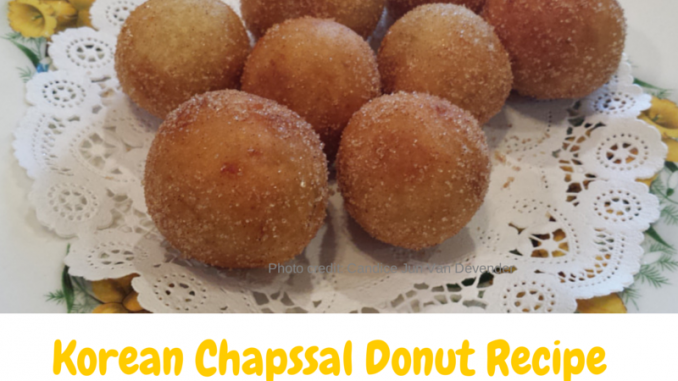 These churro-like donuts are so popular that they are often sold in Korean bakeries. 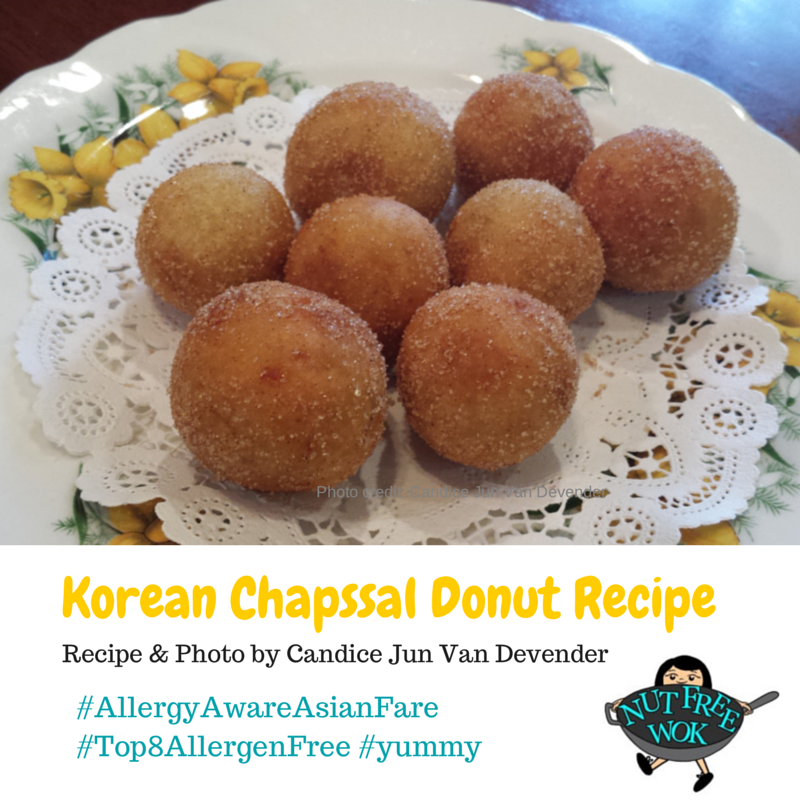 However, her daughter who has a severe peanut allergy experienced severe allergic reactions due to eating treats from a Korean bakery, Candice saw recipes posted on Pinterest and Beyond Kim Chee and she was inspired to make her own chapssal. 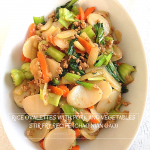 We avoid Peanuts, Tree Nuts (but not coconut), Sesame, Soy, Dairy, Egg, Gluten, Peas, Lentils and most legumes. The Trader Joe’s items above I use have been called prior to the recipe to verify if peanuts/tree nuts are in the facility or shared lines. Since Trader Joe’s products frequently change their manufacturing practices, I recommend you verify the safety for your family and call prior to using their brand or you can use brands you are comfortable with. You can substitute for other gluten free flours, make sure there are rice and tapioca in the flour. That’s what makes the center chewy. 3 medium Asian sweet potatoes purple or yellow inside —baked or steamed. 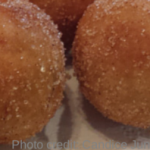 Trader Joe’s grapeseed or rice bran oil for frying — I only fill enough oil for half a donut ball to be in oil. For my saucepan I only use 1 cup of oil. Mash the sweet potatoes or use food processor. In separate bowl, mix dry ingredients —flour, sugar, salt and baking powder. Add sweet potatoes and knead. Slowly add hot milk little at a time. Once it feels like play dough make 1” balls with your hand. Children are great helpers during the rolling process. The dough is very forgiving and if it’s too dry add little more milk and if too wet, add more flour. Heat oil in small saucepan on medium heat. Test by placing a ball and if it sizzles quickly the oil is ready. Tilt the pan to make sure the balls are evenly coated during frying or use a dry metal spoon to turn over. Once they are golden, remove with a strainer and place on paper towels to absorb the excess oil. Roll the cooked donuts in bowl of cinnamon sugar. Swirl them around in the bowl. Serve donuts warm or same day. Next day donuts are not as crispy outside and chewy inside. Store extra dough in refrigerator to make more donuts in the next few days. The extra cinnamon sugar can be kept in freezer to use next time. When done, store cooled oil in glass jar to reuse. Can organic sugar be granulated sugar? Or are there any substitutes? Yes, you can use regular granulated sugar. My experience is that organic sugar tastes sweeter than granulated sugar so adjust accordingly depending on your preference.